We couldn’t do our work without the financial, moral and in-kind support of a range of organisations involved in the Wellington arts and cultural scene. We are extremely grateful for that help. Creative New Zealand Toi Aotearoa funds the New Zealand writer’s residency, providing an annual stipend currently set at $22,000 from the Toi Uru Kahikatea (Arts Development Investment) Programme. This programme provides ongoing funding on a three-year basis to support specific arts activities and programmes. 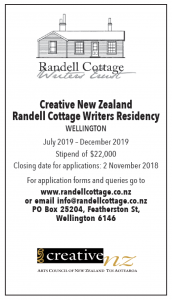 Wellington City Council provides an annual grant towards the non-discretionary operational costs (such as such as rates, insurance, and routine maintenance) of running a writer’s residency. The New Zealand France Friendship Fund was established in 1991 with the aim of promoting friendly relations between France and New Zealand. It seeks to enhance the bilateral relationship by providing financial support for cultural, community, scientific and educational projects. In 2016, the NZFFF established a legacy fund, managed by the Arts Foundation of New Zealand, enabling the French residency to be funded in perpetuity. The French Embassy manages the annual selection of the French writer and, in association with branches of the Alliance Française throughout New Zealand, runs the writer’s public programme. The National Library of New Zealand Te Puna Mātauranga o Aotearoa and the Alliance Française de Wellington, help us host our writer’s public engagements in Wellington. The National Library sessions are recorded and held in the Oral History Archive of the Turnbull Library. The Arts Foundation of New Zealand, launched in 2000, is a private charitable trust founded by New Zealand arts patrons with the aim of establishing a large endowment fund capable of providing significant and ongoing support to New Zealand artists. The Arts Foundation manages the endowment created by the New Zealand France Friendship Fund to fund the French residency in perpetuity.